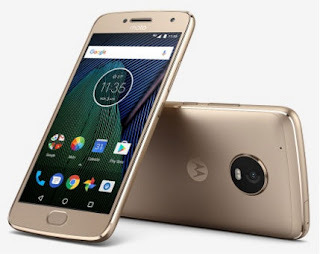 This week's Deal of the Week is the unlocked Motorola G5 Plus 64 GB LTE Android phone on sale for $239.99 214.99 at B&H after applying a $25 off coupon. To get the sale price, click the "Clip Coupon" button on the phone's sale page. The deal also includes a free Republic Wireless SIM and six months free service on Republic's unlimited talk and text an 2 GB per month plan on the T-Mobile network. You don't have to use the phone on Republic to get the phone discount. The regular price of the 64 GB G5 Plus is $299.99. It runs Android 7.0 Nougat, and has a Snapdragon 625 SOC, 4 GB of RAM, a 5.2 inch 1920x1080px IPS display, memory card slot, headphone jack, fingerprint sensor, dual band WiFi, 12 MP main camera and 5 MP front cameras. The 3000 mAh battery is not user replaceable. Update 12/19: The G5 Plus is no longer eligible for the $25 off coupon and six months free service. It was originally part of a deal that included the coupon and free service with all the Motorola E4, G4 and G5 series phone models. The deal was announced as being good until January 12, but the offer was pulled from the G5 Plus and G5S Plus after only a day. The $25 off and six months free service deal is still available on the Moto E4, E4 Play, G4 and G4 Plus. Scroll down to the B&H listing below to see those deals. TracFone Samsung Galaxy J7 Sky Pro (Verizon) 16 GB LTE Android phone with 1000 minutes, texts and MBs of data, 6 months of service, case and car charger $79.95 (reg $149.99 w/o airtime) free shipping at HSN. Verizon (or Verizon MVNO) Samsung Galaxy S5 G900V LTE Android phone (new) $155.99 Free shipping. TracFone Samsung Galaxy J7 Sky Pro (Verizon) 16 GB LTE Android phone with 1000 minutes, texts and MBs of data, 6 months of service, case and car charger $79.95 (reg $149.99 w/o airtime) free shipping. Amazon Prime On Us: Free Samsung J7 phone and free year of Amazon Prime when you port your number to MetroPCS and and activate on an unlimited LTE plan. Updated 12/22: New items and price cuts since Sunday are in bold. IMO, I'd stick with a Metro phone. Either the E4 or J7 if you hate hybrid sim slots, the Blade Max if you don't, or the $50 Stylo 3 Plus if you're feeling adventurous. All have Nougat and perform solidly enough, a port in gets you 2 lines of unlimited for $80 plus an Amazon Prime code worth $100, and the customer service is great if you have a corporate store or a decent dealer nearby. Free is the best price, although you could wind up paying about $180 for 2 phones with cases and screen protectors, 2 months of unlimited data and a year of Amazon Prime. Prime and the plans are worth $180 alone, so it more than breaks even. Now drag a bystander there and strike while the iron's hot, since I've heard the promo's getting abused which means Metro might make an overcorrection to try and recoup any losses. [email protected] 11:32, mind speaking a little clearer? Hybrid SIM trays are found on some dual-SIM phones. There can hold either two SIMs or a SIM and a microSD card. Good point on Nougat. At this time, one should really try to avoid Android phones with Marshmallow or older. This article isn't visible on the desktop site. Just me? No it was missing. Fixed now, thanks for mentioning it. As far as the free 6 months of service on Republic Wireless, is it just on the T-Mobile network, or can the free service apply to Sprint as well? I don't get T-Mobile service in my neighborhood but I do get Sprint. I don't think the free service can be used on Sprint. Republic's BYOP is T-Mobile only. Sprint service is only available on specific phones sold by Republic. Is it possible to port a number from Net10 (at&t) to Total wireless? Yes, it should be possible to port a number between Net10 and Total Wireless. Thanks Dennis, If they really lifted the throttle, 5gb for $35 sounds pretty good. Is there a better deal for an unactivated / Wi-Fi only "small media tablet" than the Verizon Prepaid Moto E4 for $39? Maybe the E4 has a newer Android version, but the G4 Play should work as a small tablet and save you $20. Oh, the ad said I was supposed to buy airtime. Maybe because I didn't, it rang up for $40 regular price, the manager came over and gave me the sale price. At worst, it looked like you could buy $5 of VZW airtime to get around that. The att prepaid iphone se is $200.00. Even after I added the $45 dollar plan, there is no discount. Am I doing something wrong? Was just on B&H site and Moto G5 Plus was $239.99 with no mention of $25 coupon or Republic Wireless bonus. You are right, thanks for the heads up. The deal on the G5 Plus appears to have ended early. I've updated the post. Amazon $100 off sale on Unlocked GSM Blu Life One X3, $149.99 again. Android 7, Octa-core 1.3, 3GB RAM, 32GB storage, 5.5" Full HD screen 400ppi, 4G LTE 1/2/3/4/7/12/17/28, 13MP camera with last front and rear, massive 5,000 mAh battery. This sale sold out in one day the last time it ran. Gonna be a lot of butthurt once they spy on users and brick their phones again. Dennis squashed this bait a few days ago. Year old story. Problem solved, won't happen again. Amazon and DHS investigated, and cleared their fixes. BLU has sold over 70M phones and they want to sell a lot more. BTW, the Life One X3 is a dual-SIM phone too. BLU forced bricking and malware is actually more recent. "Year old story. Problem solved, won't happen again." "...BLU Products is in hot water with consumers after inadvertently bricking one of its devices via an OTA firmware update.... many of those impacted are (quite rightly) unwilling to delete all of their data to fix the problem." And sorry, Android Authority is not considered clickbait. And nothing a year old really. The latest BLU spyware problem it turns out is from less than 6 months ago. I just wanted to clarify the situation about two problems that really aren't that long ago. No, the BLU life one x2 never bricked last Oct or anytime. You guys don’t even know what bricked means. Patch was issued in a week to allow update to complete; users could reset and use phones before that. The adups software was not spyware - the researchers who found the issue were careful NOT to call it that. ‘Spyware’ was a hyped term made up by trade press to sell clicks. No evidence or facts showed that BLU knew. There keep being new problems, the latest one a month ago. To buy BLU is a mistake. Simple is a TracFone brand so it's likely that their phones are very difficult and/or expensive to unlock. All 4400 Boost stores are selling prepaid Xfinity broadband kits now. TV also available on prepaid. Boost offers a bundle of xfinity with $50 unlimited plan for $90. Good article for Christine to copy. You heard it here first, PP PN readers. Xfinity broadband "is DOA." I guess that means the $40 Xfinity prepaid kit from Boost stores doesn't work. No Merry Christmas for any of the 10M unbanked US residents. What do you mean? Comcast is still selling internet, including prepaid and they are advertising that it's available at Boost stores. Some local outage? Boost customer service is even worse than Comcast. I will still go to Comcast store to buy my prepaid kit.